What Thanksgiving feast would be complete without a sampling of amazing desserts? For the very best Thanksgiving dessert ideas, our 25 Scrumptious Pies & Desserts for Thanksgiving and Beyond eCookbook will be a fabulous resource for any home cook this holiday season. This stand-out collection features traditional Thanksgiving desserts made easy, along with some fun new Thanksgiving dessert ideas. Our triple-tested recipes are so decadent you just might be tempted to eat dessert first! Sometimes it can be tough to leave room for dessert after an enormous Thanksgiving dinner of turkey, potatoes, and stuffing. But when you know these impressive desserts are waiting for you, we bet you'll be sure to save space! With our selection of great Thanksgiving dessert recipes, you can end your Thanksgiving meal on a sweet note. Our must-have eCookbook covers shortcuts to making classic pies, bakery-worthy cakes and tortes, oven-free no-bake desserts, novel holiday puddings, plus hearty crumbles and cobblers. Many of the desserts contain five ingredients or less, and some feature using slow cookers, which leaves more time for preparing other holiday dishes. And you can be thankful that these desserts won't take you all day to make! Download your free copy of 25 Scrumptious Pies & Desserts for Thanksgiving and Beyond eCookbook today. In many households, pie is the traditional Thanksgiving dessert. From easy pumpkin pie to homemade apple pie, holiday pies are a delicious staple at any Thanksgiving gathering. After much work developing and perfecting recipes for pies this season, the Mr. Food Test Kitchen is pleased to present a scrumptious selection of Thanksgiving pies! We've included classic recipes like super-easy Impossible Pumpkin Pie (page 1) and wholesome Perfect Pecan Pie (page 2) to new twists on old favorites like down-home New Sweet Potato Pie (page 3) and chocolate-y delicious Walnut Brownie Pie (page 7). Simple to prepare, these fabulously festive Thanksgiving pies are the perfect end to a perfect meal. Whether you're hosting Thanksgiving or bringing along a homemade dessert, you may be looking for a chance of pace. After all, there's more to Thanksgiving desserts than pie, pie, pie! Add some variety to the Thanksgiving table with one of our fabulous Thanksgiving cakes or tortes. 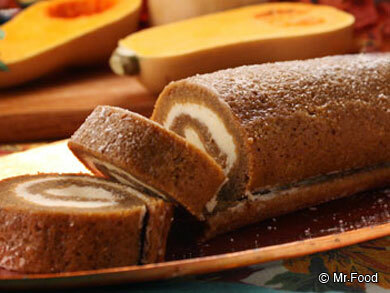 It will tough to resist our sweet Butternut Squash Roll (page 13), filled with the amazing flavors of the season. You'll never believe how easy our Chocolate Hazelnut "Torte" is to make (page 10) - our no-bake shortcut means less time in the kitchen for you! And how could we forget simple yet indulgent Easy Pumpkin Cheesecake (page 11) - this one's great any time of year. These bakery-worthy cakes and tortes are ideal for Thanksgiving, but they'll get raves at any table the other 364 days of the year, too! Make way for our most show-stopping pies, cakes, puddings and more in 25 Scrumptious Pies & Desserts for Thanksgiving and Beyond eCookbook. The Mr. Food Test Kitchen offers plenty of to-die-for desserts to make your holiday terrific, especially when paired with The Ultimate Thanksgiving eCookbook which features 40 quick & easy, must-have recipes. 25 Scrumptious Pies & Desserts for Thanksgiving and Beyond, whether used alone or as a companion to The Ultimate Thanksgiving, will save you precious time during the hectic holiday season. Not only are these Thanksgiving desserts decadent and delicious, true to the Mr. Food Test Kitchen philosophy, they're quick & easy. 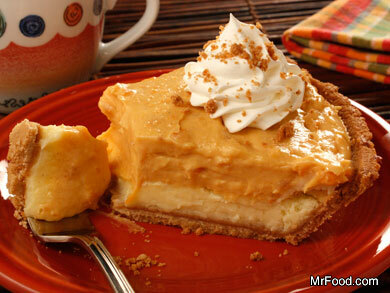 Many of these desserts are made with five ingredients of few, or even in your slow cooker! Keep an eye out for our handy recipe tags, a brand-new eCookbook feature that highlights time-saving recipes, super-easy recipes with few ingredients and special extras. Scrumptious and simple to prepare, these spectacular Thanksgiving holiday desserts will make entertaining a cinch! Download our free Thanksgiving desserts eCookbook today! 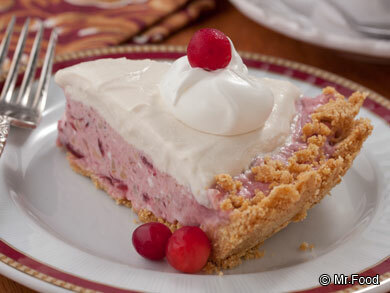 No-bake desserts are a wonderful time-saver for busy holiday cooks. Not only are they quick & easy to make, no-bake desserts also won't hog any oven space so you can make room for the turkey and sides! Let your freezer do the work and reap the rewards when your friends and family enjoy these no-bake desserts, like tart and creamy No-Bake Cranberry Pie (page 15) and smooth and rich Frozen Pumpkin Pie (page 14). Looking for a novel treat to serve at Thanksgiving? Try one of our satisfying pudding recipes, like Quick-as-a-Wink Rice Pudding (page 21) and Cranberry Pudding (page 20). For an extra-easy dessert, Cinnamon Raisin Bread Pudding (page 19) is made in a slow cooker, saving you even more time. Making cobbler from scratch can be an all-afternoon project, and the Mr. Food philosophy is all about time-saving shortcuts that don't sacrific quality! 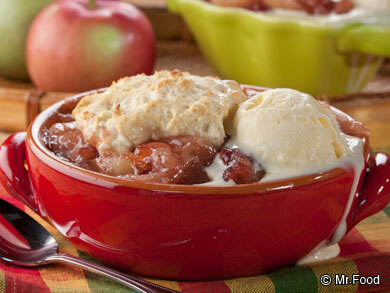 Our comforting cobblers and crumbles will taste like you spent all day in the kitchen, but your secret is safe with us. Many of these homey desserts have just five ingredients or less, and start with a mix. Our warm and cozy Fall Harvest Cobbler (page 25) uses biscuit mix, while our fruit-filled Cherry Pineapple Crumb Cobbler (page 24) has just four ingredients! And for a fun Thanksgiving dessert recipe, make or bring Apple Scrounge (page 22)—everyone will want to know what it is and how to make it this holiday season. As a fan of Mr. Food's Quick & Easy cooking philosophy, I know you can see the value in this free ebook. Try out these easy and delicious Thanksgiving recipes with the free 25 Scrumptious Pies & Desserts for Thanksgiving and Beyond eCookbook. Once you subscribe to receive our newsletter, you'll see how much fun it is to be a part of the Mr. Food community! If you've ever searched for quick and easy recipes, fast dinner ideas, slow cooker recipes or anything in-between, let MrFood.com deliver triple-tested recipes straight from our Mr. Food Test Kitchen that are both easy to make and delicious to eat. Check out this free eBook and the MrFood.com site to draw tons of inspiration for your next holiday or meal! I asked for recipe for Pumpkin flan and I got everything but that! NO GOOD<<<< TRIED TO FIND PUMPKIN SPICE ROLL<<<<<< NO LUCK!!!!!! I am looking for the pecan pie recipe also. Please let me know if you find it.